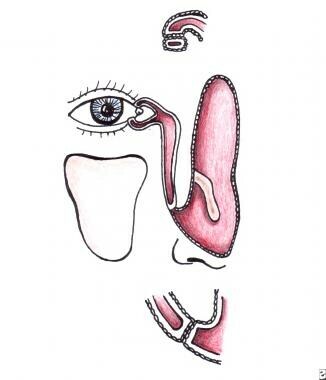 The nasolacrimal drainage system serves as a conduit for tear flow from the external eye to the nasal cavity. It consists of the puncta, canaliculi, lacrimal sac, and nasolacrimal duct (see the image below). 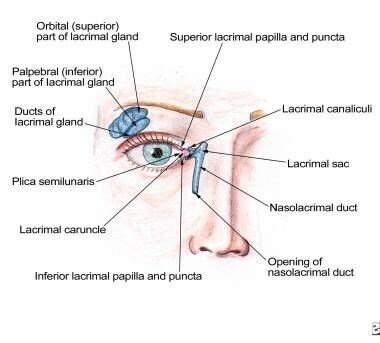 Overview of the nasolacrimal apparatus. Maxillary process grows medially and overrides the paraxial mesoderm of the nasolacrimal process. Canalization of the epithelial cords occurs simultaneously throughout their entire length, beginning at 4 months' gestation. Remnants of epithelium within the cords form inconsistent, valvelike folds. A membranous covering consisting of conjunctival and canalicular epithelium remains over the puncta (see the image below), and a covering consisting of nasal and nasolacrimal epithelium remains over the nasolacrimal duct outlet (ie, the membrane of Hasner). Punctal membranes open at full term; however, the membrane of Hasner remains imperforate in up to 70% newborns. This usually opens within the first month but may remain imperforate for a longer time, resulting in epiphora and/or mucopurulent discharge. Membrane at the puncta consisting of conjunctiva and canalicular epithelium. Membrane at the distal end of the nasolacrimal duct is adhesion between nasal mucosa and epithelium lining the nasolacrimal duct. Rapid growth of the maxillary bone in relation to the frontal bone results in greater lateral stretching of the inferior canaliculus with a subsequent lateral position of the inferior punctum with respect to the superior punctum. Epithelium at the site of the future lacrimal sac is initially thicker, and canalization in this area is more extensive. Puncta are openings 0.3 mm in diameter located on the medial aspect of the upper and lower eyelid margins. Each punctum sits on top of an elevated mound known as the papilla lacrimalis. The puncta are relatively avascular in comparison with the surrounding tissue, giving them a pale appearance, which is accentuated with lateral traction of the lid. This pallor can be helpful in localizing a stenosed punctum. Puncta are directed posteriorly against the globe; therefore, they are not usually visible unless the eyelid is everted. Punctal ectropion may lead to inadequate tear drainage and resulting epiphora. The inferior punctum is approximately 0.5 mm lateral to the superior punctum, with distances to the medial canthus of 6.5 mm and 6.0 mm, respectively. Tears within the medial canthal area enter the puncta to pass into the canaliculi. Canaliculi have an initial vertical segment, measuring 2 mm, followed by an 8-mm horizontal segment (see the image below). The angle between the vertical and horizontal segments is approximately 90 degrees, and the canaliculi dilate at the junction to form the ampulla. In most individuals, the horizontal portion of the canaliculi converges to form the common canaliculus. Canaliculi pierce the lacrimal fascia before entering the lacrimal sac. 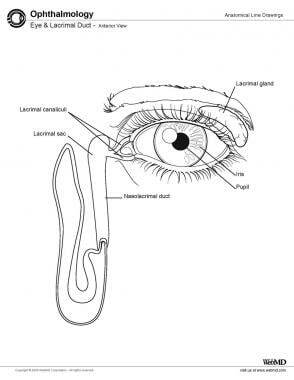 At its entrance to the lacrimal sac, the common canaliculus may dilate slightly, forming the sinus of Maier. 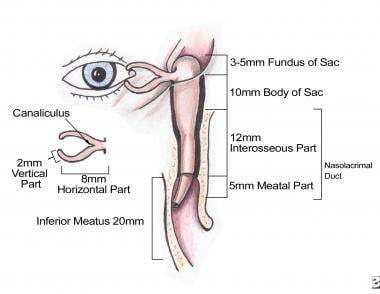 Dimensions of the lacrimal drainage apparatus. Canaliculi are lined by nonkeratinized, stratified squamous epithelium and are surrounded by elastic tissue, which permits dilation to 2 or 3 times the normal diameter. The oblique entrance of the common canaliculus into the lacrimal sac forms the valve of Rosenmüller, which prevents retrograde reflux of fluid from the sac into the canaliculi. However, the posterior angulation of the upper and lower canaliculi followed by anterior angulation of the common canaliculus may also block reflux at the canaliculus-sac junction. An incompetent valve of Rosenmüller is observed clinically as air escaping from the lacrimal puncta when the individual blows his or her nose. The lacrimal sac sits within the lacrimal fossa, which is bound anteriorly by the frontal process of the maxillary bone (anterior lacrimal crest) and posteriorly by the lacrimal bone (posterior lacrimal crest). (See the image below.) 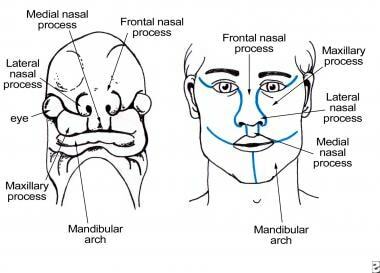 Differing proportions of lacrimal bone and maxillary bone make up the lacrimal fossa; the position of the vertically oriented suture between them is variable. The thickness of the lacrimal bone varies;  however, one study found an average thickness of 0.1 mm. Because the lacrimal bone is generally thinner than the maxillary bone, during dacryocystorhinostomy a perforation of the lacrimal bone can be made, followed by extension of the osteotomy to include the maxillary bone. The lacrimal bone can be localized intranasally by its position, which is anterior to the uncinate process of the ethmoid bone. The lacrimal sac is lined by a double-layered epithelium (superficial is columnar, and deep is flatter). It can be divided into a fundus superiorly and a body inferiorly. The fundus extends 3-5 mm above the superior portion of the medial canthal tendon, and the body extends approximately 10 mm below the fundus to the osseous opening of the nasolacrimal canal. At the posterior lacrimal crest, the orbital periosteum splits to envelop the lacrimal sac as a covering known as the lacrimal fascia. This periosteum then continues inferiorly to enclose the nasolacrimal duct. The lacrimal fascia is surrounded by fibers of the orbicularis oculi muscle; the superficial head of the muscle travels around the front of the sac to attach to the anterior lacrimal crest, and the deep head of the muscle travels behind the sac to attach to the posterior lacrimal crest. Between the lacrimal fascia and the lacrimal sac lies a venous plexus. The orbital septum attaches to the medial orbital wall at the posterior lacrimal crest, so the lacrimal sac is a preseptal structure. The double layer of epithelium similar to that observed in the lacrimal sac lines the nasolacrimal duct. The venous plexus surrounding the lacrimal sac continues inferiorly to surround the nasolacrimal duct, eventually connecting to the vascular tissue of the inferior turbinate. Although multiple valves have been named throughout the nasolacrimal duct, most have been inconsistently anatomically identified. The valve of Hasner, at the opening of the nasolacrimal duct within the nasal cavity, has been found to be imperforate in up to 70% of newborns. Spontaneous opening of an imperforate valve of Hasner usually occurs within 6-12 months. Tucker NA, Tucker SM, Linberg JV. The anatomy of the common canaliculus. Arch Ophthalmol. 1996 Oct. 114(10):1231-4. [Medline]. Hartikainen J, Aho HJ, Seppa H. Lacrimal bone thickness at the lacrimal sac fossa. Ophthalmic Surg Lasers. 1996 Aug. 27(8):679-84. [Medline]. Ipek E, Esin K, Amac K, Mustafa G, Candan A. Morphological and morphometric evaluation of lacrimal groove. Anatomical Science International. December 2007. 82(4):207-10. [Medline].